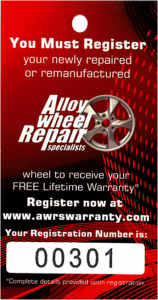 AWRS offers a free, lifetime warranty on alloy wheel repair services performed by our technicians. Each Alloy Wheel Repair Specialists business is independently owned and operated under a franchise agreement with Wheel Repair Solutions International, Inc., a Georgia Corporation. The Franchisee that is providing the service to you has agreed to honor a limited warranty on the workmanship of the repair for the life of the wheel. This warranty is only in effect for the original retail consumer purchaser of the service and is non-transferable.